"This classic dish won't leave you with a carb overload. 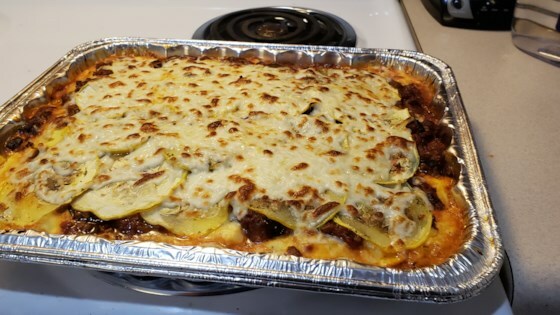 The butternut squash offers a unique substitution to your typical lasagna noodles!" Arrange butternut squash slices in a single layer on each baking sheet. Drizzle 1 tablespoon of olive oil over each layer; season each with 1 teaspoon Italian seasoning, salt, and pepper. Bake in the preheated oven until squash is soft but still firm to the bite, about 15 minutes. Heat a large skillet over medium heat; cook and stir beef and garlic until browned, about 5 minutes. Drain grease. Mix in remaining 1 teaspoon Italian seasoning, pasta sauce, brown sugar, basil, and 1 1/2 teaspoon salt. Simmer, stirring occasionally, until flavors combine, about 10 minutes. Mix remaining 1 teaspoon salt, ricotta cheese, eggs, 1/2 cup Parmesan cheese, and parsley together in a bowl. Layer 1/3 of the squash slices in the bottom of a 9x13-inch baking dish. Cover squash with 1/2 of the ricotta mixture, 1/2 of the mozzarella cheese and 1/3 of the beef mixture. Repeat layers, ending with remaining squash slices and sauce. Sprinkle 2 tablespoons Parmesan cheese on top. Bake in the preheated oven until cheeses are melted and sauce is bubbly, about 30 minutes. Let stand for 10 minutes before serving. This was amazing! Will definitely make it again.